While the age-old adage says that ‘Rome wasn’t built in a day’, the Ciao Roma hop-on, hop-off bus certainly allows you to see the city in its entirety. For around €20, you get a ticket valid for 24hr, which takes you to all the major tourist attractions and must-sees, allowing you to hop-on and off as you will and it’s a great way of seeing the whole city if you have very limited time as I did. Beginning with the toll of the bells at the Basilica Santa Maria Maggiore, we made our way in a clockwise route around the city, taking in all the major sights, starting with the Ancient Centre, which includes The Capitol, the southern summit of the Capitoline Hill, one of the seven hills of Rome and the symbolic centre of the Roman world; Palatine Hill, where Romulus is said to have founded Rome in the 8th Century BC; the Forum, once the focus of political, social, legal and commercial life in Rome and the Colosseum, the centre of entertainment for all Romans. After a welcome pit-stop for the obligatory cappuccino, which is only drunk in the morning by locals, while caffe (espresso as we know it) is drunk throughout the day, we continued our journey through the streets of this sprawling city to The Vatican. Vatican City, the world capital of Catholicism and residence to Europe’s absolute monarch, the Pope, is the world’s smallest state, occupying just 43 hectares of land and closely watched over by the Vatican guard. 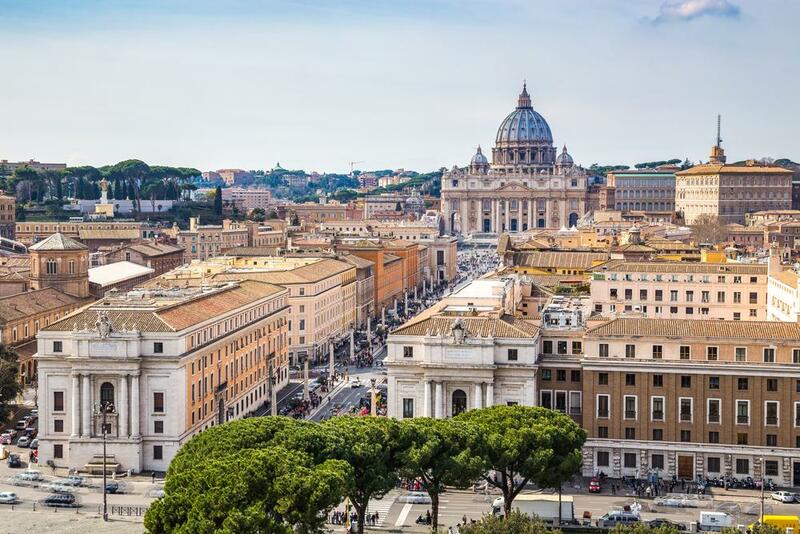 It draws massive crowds into its high walls from across the globe to see and experience the sovereign state, which is home to St Peter’s Basilica, Catholicism’s most sacred shrine, and Michelangelo’s magnificent Sistine Chapel. The queues for both the Basilica and the Vatican Museum were incredible and while it is free to enter the Basilica, the line moved fairly quickly and once inside, the masses of people dissolved into the huge interior, however getting in to see the Sistine Chapel is an experience unto itself and prepare yourself for a crush! If you are planning a visit to the Vatican Museum, it’s best to get there very early or leave it until later in the afternoon as there will be less people. Despite the masses though, both the Basilica and the Vatican Museum are absolute must-sees if you are in Rome. The Vatican Museum holds one of the world’s greatest art collections and can easily be given over to a day of wandering through its halls. The tour continued from the Vatican and I opted to hop off at the next stop and do some exploring of my own. My amblings took me through the Piazza Navona, Rome’s most beautiful Baroque piazza, where the luxurious cafés are the social centre of the city; the Pantheon, Rome’s best preserved ancient temple ‘to all the Gods’ built in AD 27; Fontana di Trevi, Rome’s famous fountain in which Sophia Loren danced in Fellini’s La Dolce Vita and into which, according to the City of Rome, nearly €700,000 worth of coins gets tossed in each year and up towards the Piazza di Spagna and the Spanish Steps, a glorious example of a Roman Baroque staircase in a classic butterfly plan and where artists, writers and tourists alike have been meeting, resting and relaxing in the sun for years. I continued weaving my way back through the streets of Rome towards my hotel, as I nibbled on unrivalled gelato and marvelled at all I had managed to absorb in just one day. Scott House Hotel is a very compact little establishment on the third floor of one the many buildings housing similar hotels and very close to the main train station, which was convenient and easy to locate. Clean and comfortable, with free Wi-fi and a mini-bar, it was a welcome respite at the end of a very long and tiring day. The history and the depth of Rome as a city is one that runs very deep and to absorb it all in just two days is impossible. But I got a good feel for the city and how she romances everyone that visits and I will most definitely go back to explore some more.